Homemade pasta is not only simple to make but also fun. And besides that I really believe it is one of the most brilliant foods there is. Think of it's versatility, nearly every culture has a version of it, and its most basic form it is nothing more than a paste made with flour, and sometimes eggs. The word pasta is in fact the Italian word meaning "paste;" Spanish is the same, and in French it is often called pâte (paste) or pâtes à l'œuf (paste with eggs)...but it does sound more appealing to eat pasta than paste. When cooked with other meager ingredients, pasta becomes not only delicious but a delicious meal...the paste--or pasta--absorbs the flavor of whet it is cooked in. We made this for employee meal today for the simple reason that I enjoy making it, but more importantly, love eating it. Anyhow, I originally had the below text and recipes published in Artvoice some years ago, but I also posted on this blog previously (where you can see additional pictures of the dough being made). In today's world that so often seems to be racing and spiraling out of control, and in a time when restaurant food performs gravity defying feats on a daily basis, there is no other therapeutic food to create with your hands than pasta. This is not to imply that pasta has curative properties, but rather, the act of making pasta can actually be a form of relaxation and meditative medium. It's a humble and inexpensive food, and can easily be an entire meal; in its most basic form pasta is simply a paste of eggs and flour. The art of making pasta dough by hand is one that should be relished—ditto for bread dough. But with the proliferation of mechanical means—fancy electric mixers, food processors, bread machines, etc.—the age-old process of producing silky smooth pasta by hand is often overlooked and forgotten. Though it would be untrue to state that pasta mixed manually was an easy task, once mastered the process is quite enjoyable. The dough has to be mixed enough to develop the gluten in the flour, and then kneaded further until it starts to break some of the gluten down to a certain extent and incorporate some air into the dough, which, in turn, will yield a perfectly smooth and workable dough. One should not approach this task in an anticipated state of drudgery, but hopefully, with appreciation. For inspiration while cooking, I'll often set before me the ingredients at hand, in the case of pasta this entails flour and eggs, and sometimes water, oil or salt. It's interesting to look at these few items and visualize their origins, functions, how they change when combined with one another and what the resulting product will be. Try to imagine the grains of flour swelling to accept the liquid, and the proteins aligning and clinging to themselves, almost fighting against the force of your hands to create structure in the dough. Ultimately, the ingredients will not be distinct and separate any longer, but something new, one single component or mass: dough. And though, I'm sure, that all of these ingredients were harvested separately with the use of mechanics, when they are set out in their most simple and basic form, it often seems unsuitable to mix the dough with anything other than your hands. 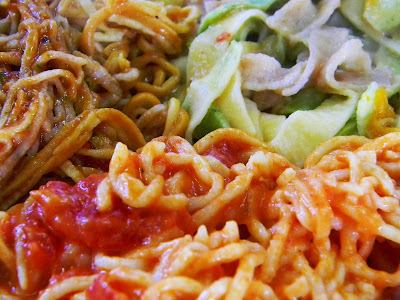 Pasta is, as its name suggests, a paste. The paste is most often made with flour and eggs, water sometimes replaces all or a portion of the eggs; vegetable purées can be added, and also salt, oil, herbs or spices. There is no need for special equipment; your hands are the best tools that you can ever own. The finished dough can be rolled and cut using a simple rolling pin and large knife, or with the aid of a hand-cranked pasta machine, the latter taking less effort and offering more consistent results. There is no denying that for a beginner, to make pasta by hand takes practice—the making of the dough is actually very easy, it's the kneading and rolling that takes quite a bit of effort. The incredibly inspirational writer and culinary educator Madeleine Kamman states the benefits of making pasta entirely by hand in her voluminous book The New Making of a Cook. One of the benefits, she says, is that you will be 1 or 2 pounds lighter in weight upon completing the task. incorporate some of the flour into the eggs. When enough flour has been combined with the eggs to form a loose paste or batter, mix in the rest of the flour with your hands and bunch it together to form a crumbly ball. Begin to knead the dough by pushing and stretching it away from you with the heel of your hand, then fold it and pull it back towards you with your fingers. In a very short while you will have before you a homogenous ball of dough, that's the easy part. The more difficult process is to knead it for another 15 minutes. What you have to do is develop the gluten in the dough which will give it strength, and then knead it beyond that point until it starts to break some of this gluten down, which will make a smooth dough that is easy to work with. Eventually, after a sufficient amount of kneading, you'll note a change in the dough—it will become much smoother, slightly lighter in color and more pliable. 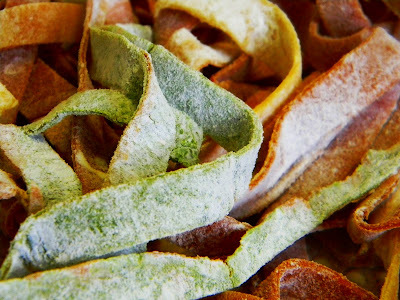 Wrap the dough in plastic and set it aside for 30 minutes, the gluten needs to relax. After the pasta has rested it can be rolled out to a desired thickness (roll it thinner than actually needed as it will swell when boiled). 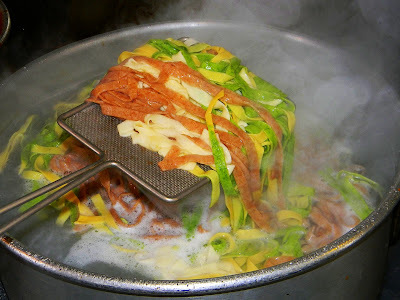 This done, it can be cut into any number of shapes, or used for lasagna, ravioli or tortellini. 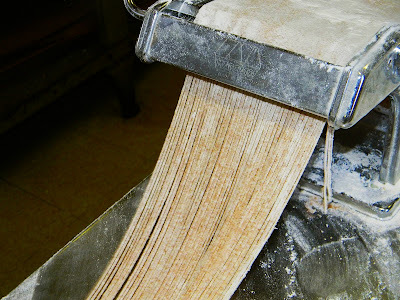 Raw sheets of dough can also be floured and layered between sheets of parchment then frozen for future use. Cooking fresh pasta takes a fraction of the time as dried. It needs only 3 or 4 minutes to thoroughly cook in rapidly boiling water; stuffed pasta takes longer to cook for obvious reasons. The next time you've time on your hands and are searching for culinary inspiration, make pasta by hand. It will be good for you. Place 2-1/2 cups of the flour in a mound on a worktable and make a well in the center. In the well, place the eggs, water and salt. Using a fork, beat the liquids and slowly incorporate the flour. When the liquids are fully incorporated into the flour begin to knead the dough. Knead the pasta dough for 15 minutes while working in the remaining 1/2 cup of flour. Wrap the dough in plastic wrap, refrigerate it and allow it to rest for at least 30 minutes before using. Roast the pepper by placing it directly over an open flame, either on stove indoors, or for a smokier flavor, over an outdoor grill. Cook the pepper until the skin is almost entirely black, then place it in a paper bag. After the pepper has been resting in the bag for 5 minutes, remove it from the bag and rinse it under cold running water and rub the charred skin away. Gently tear open the pepper and remove and discard the seeds and stem. Purée the pepper in a blender until it is perfectly smooth, then pour the purée into a measuring cup. The purée should measure 1/2 cup, if it does not, add enough water to compensate. On the other hand, if the purée is greater than 1/2 cup, remove the excess portion and reserve for future use. Mound the flour on a worktable and make a well in the center. In the well, place the eggs, pepper purée and salt. Using a fork, beat the liquids and slowly incorporate the flour. When the liquids are fully incorporated into the flour begin to knead the dough. Knead the pasta dough for 15 minutes. Wrap the dough in plastic wrap, refrigerate it and allow it to rest for at least 30 minutes before using. Combine the flours together in a small bowl, then mound 2-1/2 cups of the mixed flours onto a worktable and make a well in the center. In the well, place the eggs, water and salt. Using a fork, beat the liquids and slowly incorporate the flour. "Try to imagine the grains of flour swelling to accept the liquid, and the proteins aligning and clinging to themselves . . ."
kfg...so sorry to hear that. Modern day Kryptonite. Much of my diet is derived from (whole) grain. I'd be very sad if I couldn't eat it. I'm not denied whole grains, just the Mesopotamian ones really, but that whole bit about the proteins aligning and clinging sends a chill down my spine.